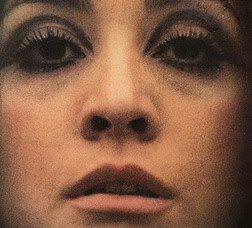 Martha Carmen Josephine Hernandéz Rosario de Veléz (born August 25, 1945 in New York City) is an American singer and actress of Puerto Rican descent. Veléz is the former wife of famous trumpet player Keith Johnson. Her son is performance artist,writer/poet, singer, Taj Johnson. Taj appeared as series regular for two years on Parker Lewis Can't Lose. Her brother is the famous percussionist, Gerardo Velez, who has worked with Spyro Gyra, Patti LaBelle, Jimi Hendrix and Van Morrison. Veléz started singing at 5 years old and won an opera scholarship at 12 years old, being a mezzo soprano. She studied for 3 years then went to the High School of Performing Arts in New York City. She holds a Masters Degree from Antioch University in Clinical Psychology and a Ph.D. from Pacifica Graduate Institute in Cultural Mythology and Depth Psychology. She is a founding Fellow of the Imaginal Institute of Ojai, California. As a playwright, she wrote the award-winning play, Power of the Powerless. She continues to use her brilliant voice as a singer for good will and social change. She began her recording career with the prominent folk singing group The Gaslight Singers on Mercury Records. She was the female singer with Earl Mann, Al Alcabes and Jeff Hyman. Veléz released her debut blues/rock album Fiends And Angels on the Sire/Blue Horizon Records label in 1969; the album also features Eric Clapton. Christine McVie, pianist (Fleetwood Mac) guitarist Al Anderson also worked with her. In May 1975 she travelled to Jamaica for three weeks to record with reggae star Bob Marley. She is the only American artist for whom Marley functioned as musical producer - the results were "Escape From Babylon." Also, producer Craig Leon greatly contributed to this association. He asked Marley about doing the music with her; Marley listened to her composition, "Living Outside the Law" from her 1972 album, "Hypnotized", on the strength of having a philosophical kinship with her along with her extraordinary voice. Marley's very positive response took them into the studio with his earlier producer Lee "Scratch" Perry to work on producing Veléz's album Escape From Babylon in 1976. The album also featured two Marley covers (Bend Down Low, Get Up, Stand Up) and a Veléz-Marley composing collaboration Disco Night. The songwriting credits were given to Rita Marley because of Marley's dispute with his publishers at the time. After Escape From Babylon Veléz released two further albums, American Heartbeat (1977) and the compilation Angels Of The Future Past (1989), which did not include any songs from American Heartbeat because the masters were missing at the time. She then resumed her career as an actress which began as the lead in Hair on Broadway. She moved on to movies and TV series. She was a series regular in the Norman Lear sitcom AKA Pablo in 1984 and played a recurring role in Falcon Crest (1986). In 1997 she acted in One Eight Seven along with Samuel L. Jackson. She also worked in films with Julianne Moore (Safe), Halle Berry and Patrick Swayze (Fatherhood), Dennis Hopper (Nails),and played a lead role in the (Sundance) winner Star Maps directed by Miguel Arteta produced by Mathew Greenfield. The Isley Brothers began singing gospel in their hometown of Cincinnati, U.S.A. During the early 50's, the trio were accompanied by their brother Vernon, who died in a car crash during 1957. The group relocated to New York the following year and issued a few one-off singles before being signed by the RCA Records production team, Hugo And Luigi. One of their compositions 'Shout' built the group a reputation during live performances. The song sold well in the black market, and has since become an R & B standard and covered by several rock artists including the Beatles and Lulu. The Isleys switched labels to Wand in 1962, where they enjoyed another sizeable hit with a cover version of the Top Notes' 'Twist And Shout', another song covered by the Beatles. The following years the group recorded for the labels, Wand and United Artists. A brief spell with Atlantic Records in 1964 saw the release of , 'Who's That Lady? ', that did not do well at the time, but was to see a renaissance a decade later on. The Isleys then formed their own company, T-Neck Records, in 1964, something not encouraged by a mainly white run music business at the time. The first release on the label, 'Testify', showcased their young lead guitarist, Jimi Hendrix. That record's experimental sound went largely unnoticed, and the Isleys, T-Neck and Hendrix went their separate ways. The Isleys then signed a contract with Motown Records. At the Motown outset the group were teamed with the songwriting partnership of Holland / Dozier / Holland. By 1966, the song 'This Old Heart Of Mine' became a huge hit in America and a hit four years later in the U.K. 'Behind A Painted Smile' and 'I Guess I'll Always Love You' were reissued in the U.K. and became hits in the U.K. towards the end of the 60's. The Isleys reactivated T-Neck in 1969 and took on a different look to refurbish their image. The group added two younger brothers: Ernie Isley (b. 7th March 1952; guitar) and Marvin Isley (bass) as well as a cousin, Chris Jasper (keyboards). In America, 'It's Your Thing' and 'I Turned You On' scored at the end of the Sixties, whilst the U.K. were catching up with several earlier Motown releases. These records employed a funkier sound, inspired by the likes of James Brown And The JB's. Between 1969 and 1972 a live double set featured extended versions of their recent hits, and 'In The Beginning', a collection of their 1964 recordings with Jimi Hendrix. In the early 70's, the Isleys incorporated into their repertoire a variety of rock material by composers such as Bob Dylan, Stephen Stills, Todd Rundgren and Carole King. By 1973, the album '3 + 3', became the first album issued via a distribution agreement with CBS Records. This albm set the course for several excellent outings throughout the Seventies and early Eighties. Ernie Isley's guitarwork (influenced by Jimi Hendrix) became central in the Isleys' sound, and was featured on the album's lead single, 'That Lady', a more successful version of their underrated 1964 single on Atlantic. '3 + 3' also contained soft soul interpretations of material by Seals And Croft, James Taylor and the Doobie Brothers. 'Highways Of My Life' demonstrated Ronald's own developing songwriting skills. 'The Heat Is On' in 1975 showcased the two sides of the groups' songwriting stylings. Side one would become the funkier, social commentary side of the groups writings. Side two would highlight their more romantic leanings, epitomised by the soul standard 'For The Love Of You'. It was this formula that stayed with the band for the following late Seventies and early Eighties offerings. 'Harvest For The World' (1976) proved to be one of the Isleys' most popular recordings. The song became a hit, in 1988, within the pop charts for the Christians. In the late 70's, the Isley's albums became popular within the Disco genre with Black & White audiences. 'The Pride', 'Take Me To The Next Phase', 'I Wanna Be With You' and 'Don't Say Goodnight' all topped the black music charts. 'It's A Disco Night', a U.K. hit in 1980, came from the double album 'Winner Takes All', which also included the excellent 'Let Me In Your Life'. In the mid Eighties, Ernie and Marvin Isley and Chris Jasper left the group to form the successful Isley, Jasper, Isley combination. The rest of the group still recorded under the Isley Brothers banner, however, when O'Kelly Isley died from a heart attack on 31st March 1986, the group rested for a while. Ronald and Rudolph dedicated their next release, 'Smooth Sailin', to him. That album was produced by Angela Winbush with the title track highlighting. Angela took over the artistic control of the group, and she wrote and produced their 1989 release 'Spend The Night', which was effectively a Ronald Isley solo album.The Isley Brothers legacy, has influenced several artists during the Nineties onwards, notably R Kelly on his 'For The Love Of You' sounding, 'Your Body's Calling'. Their 1996 release 'Mission To Please' attempted to move them into the same smooth urban soul territory as Keith Sweat and Babyface. In 2001, the group returned to recording releasing 'Eternal', which featured vocal and production input from R Kelly, Raphael Saadiq, Avant, Jill Scott and Jimmy Jam & Terry Lewis. An album entitled 'Body Kiss' was released in 2003 for the Dreamworks imprint. Their series of US hits from the 50's to the 90's is one of the major influences on Black American music. Baby Cortez - The Isley Way (1970) - T-Neck keyboardist, solo album covering Isley tracks. b. David Eli Ruffin, 18th January 1941, Whynot, Mississippi, U.S.A.
d. 1st June 1991, Philadelphia, Pennsylvania, U.S.A.
David Ruffin was one of the most recognisable vocalists to have emerged from the Motown Records stable. He was the younger brother of Jimmy Ruffin and the cousin of Melvin Franklin of The Temptations. David was the son of a minister, and commenced his singing career with the gospel group the Dixie Nightingales.He was also the drummer and singer in the doo-wop group the Voice Masters in 1958. David then signed to the Anna label in Detroit as a solo artist in 1960. His released singles at that label and on the Check-Mate imprint in 1961. In January 1964, David replaced Eldridge Bryant as the tenor vocalist in the Temptations line-up. The original arrangement was that he would support Eddie Kendricks as a background vocalist, however, he was soon elevated to featured vocalist on many subsequest releases. From 1965 onwards David became the lead singer on several of the bands hits including 'My Girl'’, Wish It Would Rain', 'I'm Losing You' and 'Ain't Too Proud To Beg'. David was becoming recognised as the lead vocalist within the group. Motown, however, felt that some of his behaviour left a little to be desired and he lost the outright lead singer status by 1968. It was this occurrence that led to David embarking upon a solo career, with 'My Whole World Ended', becoming a Top 10 hit in 1969. These recordings were undertaken under the wings of producers Harvey Fuqua and Johnny Bristol. David also recorded with his brother, Jimmy, at the time. Throughout the Seventies, his work with Van McKoy became highly popular, especially with his personal renaissance album ‘Who I Am’ that contained the pop smash ‘Walk Away From Love’, a huge hit both sides of the Atlantic. In 1976, he released ‘Everything’s Coming Up Love’, an album that became highly regarded amongst soul fans in the U.K. In 1979, he left Motown for Warner Brothers Records. Here he recorded ‘So Soon We Change’ in 1979, that featured ‘Let Your Love Rain Down On Me’ and ‘Morning Sun Looks Blue’, an album that was to be held in high regard in the following decades. 'Gentleman Ruffin' followed in 1980. In the early 80's David was briefly jailed for tax evasion, however a Temptations reunion in 1982 brought him back into contact with Eddie Kendricks. Following this liaison, Ruffin and Kendricks established a regular partnership. They were showcased in a prestigious concert at New York's Apollo by long-time Temptations fans, Hall And Oates, which was captured on a 1985 live album, and Ruffin and Kendricks also joined the rock duo at the Live Aid concert in Philadelphia. They subsequently recorded a well-received album of duets for RCA which revived memories of their vocal collaborations with the Temptations two decades earlier. The pairing also released one album in 1987, simply, entitled ‘Ruffin And Kendricks’, which contained the modern soul tunes, ’I Couldn’t Believe It’ and ‘Don’t Know Why You’re Dreamin’, produced by Ronnie McNeir. David recorded with Ian Levine's Motor City label in 1990, a stint including 'Hurt The One You Love' and toured with Eddie Kendricks and Dennis Edwards as 'Tribute To The Temptation's on a package tour in 1991. A few weeks after the last performance David Ruffin died in tragic circumstances following an overdose of crack cocaine. Thanks to these blogs : Another Sucker On The Vine, Frisian's Favourites. The Temptations were formed in 1961 in Detroit, Michigan, U.S.A., by former members of two local R & B groups. Eddie Kendricks (b. Edward James Kendrick, 17th December 1939, Union Springs, Alabama, U.S.A., d. 5th October 1992, Baptist Medical Center-Princeton, Ensley, Alabama, U.S.A.) and Paul Williams (b. 2nd July 1939, Birmingham, Alabama, U.S.A., d. 17th August 1973, Detroit Michigan, U.S.A.), both sang with 'The Primes'. Melvin Franklin (b. David Melvin English, 12th October 1942, Montgomery, Alabama, U.S.A., d. 23rd February 1995, Los Angeles, California, U.S.A.), Eldridge Bryant (Eldridge 'Al' Bryant, b. 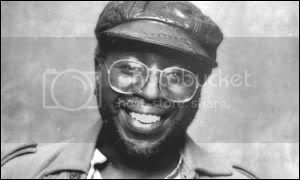 28th September 1939, Michigan, U.S.A. d. 26th October 1975, Orange County, Florida, U.S.A., buried in Thomasville, Georgia, U.S.A.) and Otis Williams (b. Otis Clayborn Williams, 30th October 1941, Texarkana, Texas, U.S.A. His mother was Hazel Lee Williams) were part of 'The Distants'. 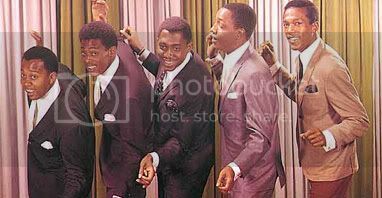 The Temptations were formed out of two groups, the Primes (whose line up included Eddie Kendricks, Paul Williams and Kell Osborne) and the Distants (who in 1959 recorded the single 'Come On' for the Northern imprint). The Primes manager had even put together a girl version of the group, the Primettes (three of the Primettes, namely, Diana Ross, Mary Wilson and Florence Ballard were later to form the Supremes). 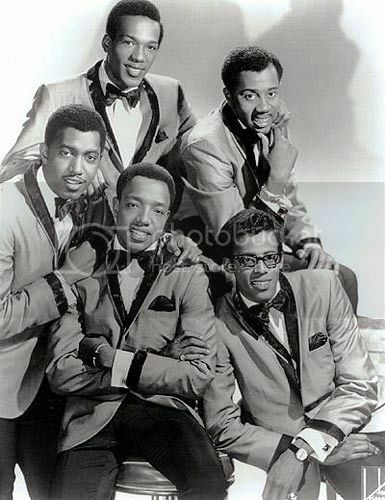 After the Primes and the Distants had merged, they became the Elgins, a name that was later to change to the Temptations in 1961, at the request of Berry Gordy, who took the group to his Motown Records imprint. Under the new mantle, they recorded three sides for the Miracle label (a Motown subsidiary), one of which was under the name of the Pirates. They later moved to the Gordy imprint where they made the charts in 1962 with the song 'Dream Come True'. Gordy then teamed up the Temptations with Smokey Robinson, a liaison that was to prove highly fruitful. 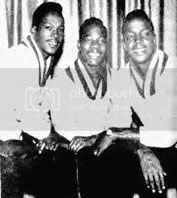 In 1963, Eldridge Bryant left the group (or was fired after physically attacking Paul Williams) and David Ruffin was recruited to the ranks, bringing to the music scene, what is considered by many to be, the 'classic' Temptations line-up. David's coarser delivery proved to be the perfect foil for Eddie Kendricks' softer falsetto style of singing. Between 1963 and 1965 the group recorded several chart hits, kicking off proceedings with 'The Way You Do The Things You Do'. 1965 saw the group hitting the number one spot with the song 'My Girl', with David Ruffin taking the lead. 'It's Growing', 'Since I Lost My Baby', 'My Girl' and 'Get Ready' followed on with varying levels of success into the following year. A parent album was released entitled 'Temptations Sing Smokey', an album considered by many pundits to be the finest album of that decade. By the end of 1966, Smokey took a back seat as the groups Producer, with Norman Whitfield taking the helm. Norman was to be employed in this role for the following decade, teaming up with the singer / songwriter Barrett Strong. 'Ain't To Proud To Beg' was the initial release under the new tutelage. 'Beauty Is Only Skin Deep' made the Top Three, followed by 'I'm Losing You' and 'You're My Everything'. The group also charted at the top spot with the classic song 'I Wish It Would Rain', the groups sixth number one tune. By this time, David Ruffin had taken on the role of singing lead, which led to requests that he had an individual credit for his efforts. This was refused and, after failing to appear at a 1968 live performance, the other four Temptations fired him and David left the line-up. The lead singer in the group the Contours, Dennis Edwards, was then drafted into the ranks. Norman Whitfield, following a need to take the group in a new direction, moved the groups sound into an area that reflected the burgeoning psychedelic scene of the late Sixties. 'Cloud Nine' reflected this political shift with it's obvious drug connotations. The Civil Rights movement of the time also became reflected in Norman and Barrett Strongs writings, typified in the song 'Ball Of Confusion (That's What the World Is Today)'. The issues effecting teenagers were addressed by the song 'Runaway Child, Running Wild'. Personal issues were also addressed in the form of 'I Can't Get Next To You', a song that hit the number one spot. Even the Vietnam War came under Norman's scrutiny in the guise of 'Stop The War Now'. Norman Whitfield set a musical styling that was way ahead of it's time and still influences the songwriters of today. The groups new direction left Eddie Kendricks feeling uncomfortable with his vocal stylings being suited more to a ballad format. He recorded some sides with the Supremes during the latter part of that decade. Eddie did receive the lead role on the number one hit 'Just My Imagination', a beautiful song, however, he was to leave the group in 1971 to pursue a solo career. Richard Owens was then drafted in to replace Eddie, who was in turn substituted for Damon Harris the same year. Paul Williams then departed the group, replaced by another member of the Distants, Richard Street. In 1971, the group had a hit with 'Superstar (Remember How You Got Where You Are)'. The following year, the group scored another number one hit with the song 'Papa Was A Rolling Stone', a song that perfectly embodies the production techniques of Norman Whitfield. The song was later to win a Grammy Award. Paul Williams, tragically, commited suicide in 1973 by shooting himself, following years of depression and drug abuse. Norman and Barrett's liaison ended the same year. The groups fortunes waned somewhat, although there were some excellent releases, including 'Masterpiece', The Plastic Man' and 'Let Your Hair Down' in 1973, followed by 'Happy People' two years later. In 1975, Norman Whitfield left Motown, Damon Harris had left the line-up, replaced by Glenn Leonard. 1976, saw Dennis Edwards leaving, Louis Price replacing him, and the group leaving Motown for the Atlantic imprint after the group recorded 1976's 'The Temptations Do the Temptations', their final album for Motown. At Atlantic the group had a dabble with the disco market, releasing the LP's 'Bare Back' and 'Hear to Tempt You'. This change of labels brought the group little chart success resulting in a return to the Motown stable. Dennis Edwards rejoined the ranks and in 1980 the group released the album 'Power'. In 1982, they teamed up with Rick James, recording the album 'Reunion', featuring the dancer 'Standing On The Top'. This album also saw a return to the fold for Eddie Kendricks and David Ruffin, however, this arrangement was to be shortlived. After the departure of the pair, Ron Tyson replaced Glenn Leonard, and Ali 'Ollie' Woodson took over the role of lead vocalist from Dennis Edwards. In 1984, the group charted again with the song 'Treat Her Like A Lady', their most successful song in a decade. The parent album produced several singles including the title song 'Truly For You'. Tragedy struck in 1991 when David Ruffin died on the 1st of June 1991, after overdosing on cocaine. On the 5th of October 1992, Eddie Kendricks died at the age of 52 of lung cancer. In 1995, Melvin Franklin died after suffering a brain seizure, leaving Otis Williams (who published his autobiography in 1988) as the sole surviving founder member from the original line-up. The Temptations continued to record and perform, achieving success in 1998 with their excellent outing 'Phoenix Rising' (featuring the band utilising a sample from 'My Girl'), on the excellent song 'Stay'. A new, Grammy winning, album arrived in the year 2000, entitled 'Ear-resistable' (on Motown), which was well received. The line-up was by now, Otis Williams, Harry McGilberry Jr. (later replaced by Joe Herndon, former bass singer for Pookie Hudson & The Spaniels), Terry Wayne Weeks, Barrington Scott Henderson and Ron Tyson. In 2001, the Temptations returned to the recording studio recording the album 'Awesome'. In 2003, G.C. Cameron joined the groups ranks, and in 2004 the group released the album 'Legacy'. Harry McGilberry passed away on the 3rd of April 2006. The Temptations are, probably, the most enduring, hardworking and successful group in Soul Music. Bentley Funk, Never Enough Rhodes, Funk Classic Master, Boogie Palace, Baia boy, Fullundie, The Crooner's Corner, Oloraviejo, Avax, A Small Selection of Whatever Fills My Head, Love in the Ghetto, Taringa and ZAND. The Supremes were, probably, the first Black female group to take the art of merging popular music and fashion to another level, whilst still retaining their own R & B heritage without any artistical surrender. Their first incarnation emerged under the group name of Primettes. Betty McGlown was dating Paul Williams of The Primes at the time, and was the first Primette. Florence Ballard met Eddie Kendricks and Paul Williams of the Primes, the mangager of the male group, Milton Jenkins, created the Primettes. The Primes were later to become The Temptations. The founding members of the Primettes were Florence Ballard, Mary Wilson, (the then) Diane Ross and Betty McGlown, whom all lived at the Brewster-Douglass public housing project in Detroit. Florence Ballard had recruited Mary Wilson, who in turn recruited Diana Ross. The Primettes issued a single on a small local label, for Lupine Records (a label created just for them) entitled 'Tears of Sorrow' b/w 'Pretty Baby'. Barbara Martin was to replace Betty McGlown in 1960. In 1960, Diana Ross asked an old neighbour, the Miracles lead singer Smokey Robinson, to help the group land an audition for Motown executive Berry Gordy. Smokey organised the audition, however, he was keen to recruit to his own groups ranks, the Primette's guitarist, Marv Tarplin. After concerns regarding the Primette's ages, the group signed with Motown the following year as The Supremes. Barbara Martin then left the group in early 1962, and Diana Ross, Florence Ballard and Mary Wilson became the Supreme line-up familiar to many. The Supreme's name was only decided upon following the suggestions of 'The Darleens', 'The Sweet Ps', 'The Melodees', 'The Royaltones' and 'The Jewelettes'. Diana Ross was aginst the name 'the Supremes', initially, as she felt the name had a male influence. The Supremes early releases saw only minor success, leaving the group with a regular reputation for missing out on chart success. Diana Ross then took the place of Florence Ballard as the group's regular lead vocalist, at Berry Gordy's suggestion, which did bring chart success at last. 'When The Lovelight Starts Shining Through His Eyes', was the group's first hit in December 1963 (the song made number 23 on the Billboard Hot 100). In the spring of 1964, The Supremes recorded the single 'Where Did Our Love Go? ', (a song originally destined for The Marvelettes, who turned it down). 'Where Did Our Love Go' went on to reach number one on the U.S. pop charts,and was the first song to appear on the U.K. pop charts, where it reached number three. The follow-up releases, 'Baby Love' (which was was nominated for the 1965 Grammy Award for Best Rhythm & Blues Recording), 'Come See About Me', 'Stop! In The Name Of Love' and 'Back In My Arms Again', all topped the U.S. singles charts, whilst 'Baby Love' became the only record by an American group to reach number 1 in Britain in 1964. In 1966, 'You Keep Me Hangin' On" was awarded the 1966 Grammy for Best Pop single. Unlike many of her R & B contemporaries, Diana Ross sang the songs, note for note, with little elaboration, allowing her fragile delivery to carry the song into a radio friendly environment. Along with the Motown hit machine behind the group, the women had also become fashion role models for many young Black Americans. Much of this was accomplished under the instruction of Motown chief Berry Gordy and Maxine Powell, who ran Motown's in-house finishing school and Artist Development department. The Supremes had, by now become household names, as well as international stars. By the end of 1966, the group had scored further success on the national charts with the singles, 'I Hear a Symphony', 'You Can't Hurry Love' and 'You Keep Me Hangin' On'. An album entitled 'The Supremes A' Go-Go', became the first album by an all-female group to reach number one on the U.S. Billboard 200. The Supremes recorded albums of Broadway standards, played residencies at expensive nightclubs, and were groomed by Motown staff as all-round entertainers. A 1967 single, 'The Happening', saw the group attempt to become part of the psychedelic movement. All was not well within the group, as Florence Ballard had grown increasingly unhappy in the supporting role into which Berry Gordy had repositioned her into. Floence began to drink heavily, she put on weight, and at times could no longer comfortably wear many of her stage outfits. Resentful of the attention given to Diana Ross, Florence Ballard relied heavily upon the advice of fellow Supreme Mary Wilson, imparting her belief that Diana and Berry Gordy were intent upon her dismissal from the group. That belief saw fruition in 1967, with Florence becoming replaced by Cindy Birdsong (a former member of the Patti LaBelle and the Bluebelles group) Florence Ballard was, eventually, removed in February 1968, when she received a one off payment of $139,804.94 in royalties and earnings. Florence pursued a short lived solo career with ABC Records. She eventually sank into poverty and died abruptly on 22nd of February 1976 from coronary thrombosis at the age of 32. The Supremes name became changed to Diana Ross and the Supremes, seemingly validating Ballard's concerns. Several other Motown acts followed suit regarding the name changes, with The Vandella's becoming Martha Reeves and the Vandella's being one example. 'Reflections' was released, moving the Supremes into a new musical area, incorporating social commentary. Examples of this manifested themselves in the songs 'Love Child' and 'I'm Livin' In Shame' (the first of which was another U.S. number 1). The Supremes also formed a successful resurrected partnership / recording partnership with the Temptations, highlighted by the hit single 'I'm Gonna Make You Love Me'. During 1969, there were persistent rumours that Berry Gordy was about to launch Diana Ross on a solo career (the pair were rumoured at the time to have become an item). These fears were confirmed at the end of the year, when the Supremes staged a farewell performance. Diana Ross said her goodbyes to the Supremes with the song 'Someday We'll Be Together', a U.S. chart hit on which, ironically, she was the only member of the Supremes to appear. Diana Ross & The Supremes gave their final performance on the 14th of January 1970 at the Frontier Hotel in Las Vegas. This trio recorded the self titled 'Mary, Scherrie and Susaye' in 1976, also releasing 'Hi Energy' the same year, before disbanding the following year. The Supremes then released 'I'm Gonna Let My Heart Do the Walking', their final Top 40 hit on the Billboard Hot 100 and their third number-one single on the disco singles chart. On the 12th of June 1977, The Supremes performed their farewell concert at the Drury Lane Theatre in London. Mary Wilson attempted to assemble a new set of Supremes for recording purposes, and toured Britain in 1978 with Karen Rowland and Karen Jackson in the line-up. This did not come to fruition as the name 'the Supremes' had become the legal ownership of Motown Records. Jean Terrell, Scherrie Payne and Lynda Laurence won the rights, however, to use the Supremes' name in the UK. Scherrie began recording disco material with producer Ian Levine in 1989, for the Nightmare and Motor City labels. Levine also signed Laurence, Wilson and ex Supreme Susaye Greene to solo contracts and recorded Terrell, Lawrence and Greene for a remake of 'Stoned Love'. In 1988 the Supremes were inducted into the Rock And Roll Hall Of Fame. The career of Mary Wilson has also continued with a starring role in the Toronto, Canada production of the stage musical 'The Beehive' in 1989 and the publication of the second volume of her autobiography in 1990. In 2006, the Dreamworks movie vehicle 'Dreamgirls', saw Beyonce and Jennifer Hudson taking on the female lead parts in a movie, allegedly (and loosely), based upon the Supremes recorcding career. As a solo artist, Diana Ross is one of the most successful female singers of the rock era. If you factor in her work as the lead singer of the Supremes in the 1960s, she may be the most successful. With her friends Mary Wilson, Florence Ballard, and Barbara Martin, Ross formed the Primettes vocal quartet in 1959. In 1960, they were signed to local Motown Records, changing their name to the Supremes in 1961. Martin then left, and the group continued as a trio. Over the next eight years, the Supremes (renamed "Diana Ross and the Supremes" in 1967, when Cindy Birdsong replaced Ballard) scored 12 number one pop hits. After the last one, "Someday We'll Be Together" (October 1969), Ross launched a solo career. Motown initially paired her with writer/producers Nickolas Ashford and Valerie Simpson, who gave her four Top 40 pop hits, including the number one "Ain't No Mountain High Enough" (July 1970). Ross branched out into acting, starring in a film biography of Billie Holiday, Lady Sings the Blues (November 1972). The soundtrack went to number one, and Ross was nominated for an Academy Award. She returned to record-making with the Top Ten album Touch Me in the Morning (June 1973) and its chart-topping title song. This was followed by a duet album with Marvin Gaye, Diana & Marvin (October 1973), that produced three chart hits. Ross acted in her second movie, Mahogany (October 1975), and it brought her another chart-topping single in the theme song, "Do You Know Where You're Going To." That and her next number one, the disco-oriented "Love Hangover" (March 1976), were featured on her second album to be titled simply Diana Ross (February 1976), which rose into the Top Ten. Ross' third film role came in The Wiz (October 1978). The Boss (May 1979) was a gold-selling album, followed by the platinum-selling Diana (May 1980) (the second of her solo albums with that name, though the other, a 1971 TV soundtrack, had an exclamation mark). It featured the number one single "Upside Down" and the Top Ten hit "I'm Coming Out." Ross scored a third Top Ten hit in 1980 singing the title theme from the movie It's My Turn. She then scored the biggest hit of her career with another movie theme, duetting with Lionel Richie on "Endless Love" (June 1981). It was her last big hit on Motown; after more than 20 years, she decamped for RCA. She was rewarded immediately with a million-selling album, titled after her remake of the old Frankie Lymon and the Teenagers hit, "Why Do Fools Fall in Love," which became her next Top Ten hit. The album also included the Top Ten hit "Mirror, Mirror." Silk Electric (October 1982) was a gold-seller, featuring the Top Ten hit "Muscles," written and produced by Michael Jackson, and Swept Away (September 1984) was another successful album, containing the hit "Missing You," but Ross had trouble selling records in the second half of the 1980s. By 1989, she had returned to Motown, and by 1993 was turning more to pop standards, notably on the concert album Diana Ross Live: The Lady Sings...Jazz & Blues, Stolen Moments (April 1993). Motown released a four-CD/cassette box set retrospective, Forever Diana, in October 1993, and the singer published her autobiography in 1994. Take Me Higher followed a year later, and in 1999 she returned with Every Day Is a New Day. 2000's Gift of Love was promoted by a concert tour featuring the Supremes, although neither Mary Wilson nor Cindy Birdsong appeared -- their roles were instead assumed by singers Lynda Laurence and Scherrie Payne, neither of whom had ever performed with Ross during the group's glory days. In 2006 Motown finally released Ross' lost album Blue, a collection of standards originally intended as the follow-up to Lady Sings the Blues. The album I Love You from 2007 featured new interpretations of familiar love songs. That same year the cable television network BET honored Ross with their Lifetime Achievement Award. Those Fantabulous Strings Play The Supremes Hits - good cheesy lounge! VA - Motown in a Foreign Language - includes foreign language versions of Supremes songs. (1966) Times are Changing - promo single for Equal Opportunities campaign. "The 1st Annual benefit for the Congressional Black Caucus" (1975) - live version of "Give Me Your Love"
"Save the Children" (OST, 1973) - features live "We People Who Are Darker Than Blue" & "Give Me Your Love", also see on youtube. "Newport in New York '72, Vol. 6" - features live "Stone Junkie" / "Pusherman"